The Archive safeguards materials and documents acquired through donations and purchases. 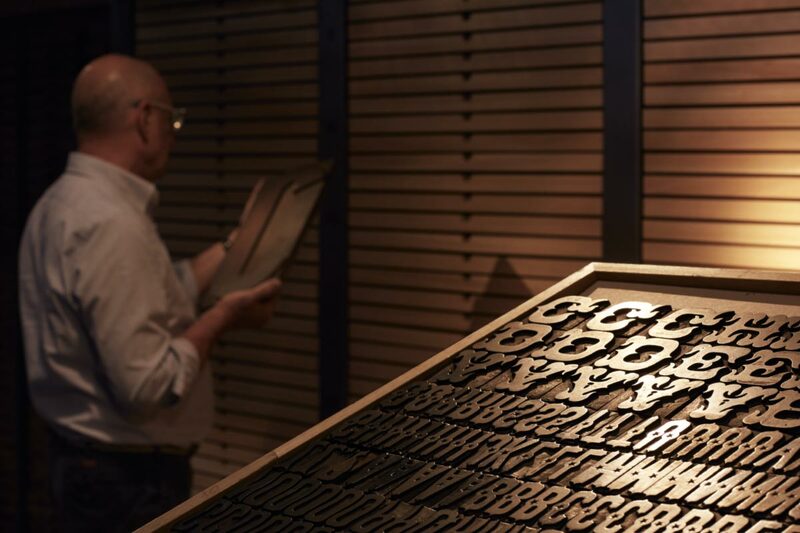 The collections represent the visual and tangible storytelling of talented Italian designers and printing companies connected to the history of typography and graphic design. After years of research, Tipoteca is about to complete the inventory of its collections, essential for exhibitions or expositions. The Amoretti were a family from Parma of engravers, founders and printers. They collaborated with Giambattista Bodoni (1740–1813) at the Stamperia Ducale in Parma. In 1791 they established their own typefoundry and print house. The Amoretti collection safeguards almost 2,000 hand-cut punches of the late 18th century. The collection is completed by 232 documents, most of which is commercial and private correspondence of the Amoretti family between 1802 and 1913. Aldo Novarese (1920–1995) was a type designer, graphic designer and painter. He dedicated his entire life to type design. The collection counts private documents (photo albums, correspondences, etc.) and other holdings related to Novarese’s collaboration with the Nebiolo typefoundry in Torino. All the material is related to his entire professional life. Luigi Melchiori (1864–1946) was a talented wood engraver, born in Crespano Veneto. He designed and manufactured wood type and ornaments. 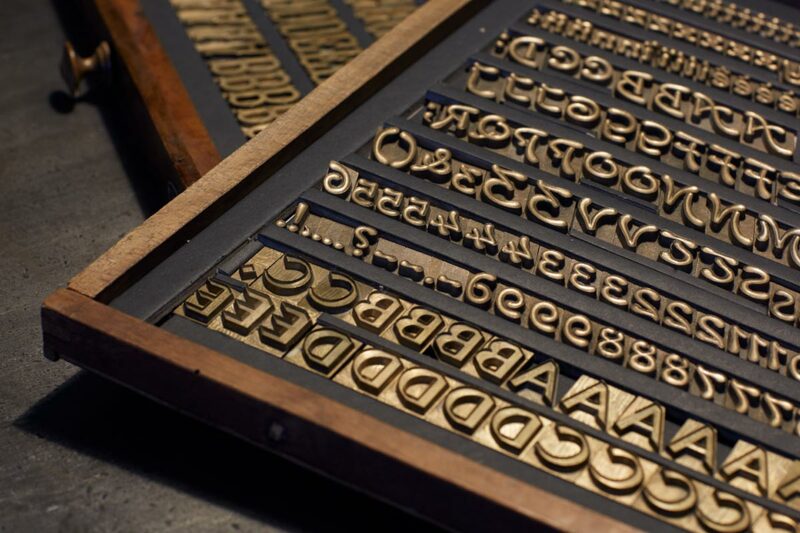 The collection basically holds the archive of his “Premiata Fabbrica di Caratteri di legno” (his type manufacturing workshop): it preserves original typefaces, working tools, specimens, posters and administrative documents. The collection is composed of 4 poster folders, 4 envelopes, 20 volumes (magazines, account books and sample books). All the holdings and documents represent Melchiori’s entire professional life. Publio Morbiducci (1889–1963) was an Italian artist: sculptor, painter and engraver. He devoted almost his entire life to wood engraving. For many years he collaborated with the art magazine “L’Eroica”. The collection is composed of wood engravings, original drawings, drafts for medals, graphic works and peculiar graphic projects (bookplates, diplomas, etc.). It contains: 8 folders, 12 wood boxes (with 52 wood engravings). The book Publio Morbiducci. Catalogo ragionato dell’opera xilografica (‘The Complete Catalogue of Wood Engravings’) edited by Francesco Parisi and published in 2013 by Tipoteca displays Morbiducci’s works as wood engraving artist. The “Arti Grafiche La Musica Moderna” is a printshop established by the Siragusa family in Milan. Since 1930, it has specialised in music score printing. The collection holds thousands of punches and other tools for plate engraving, almost 30,000 music scores released during all the years of activity. The holding documents the life of the printshop from the 1930s until the late 1990s. Nicola D’Arcangelo (1893–1975) was a skilled printer from Pescara, incredibly talented in graphic design. The collection is composed of different ephemera (calendars, postcards, unique graphic works) created from the early 1920s to the 1990s. It includes: 10 envelopes, 1 booklet, 9 paper specimens, 7 folders (calendars). 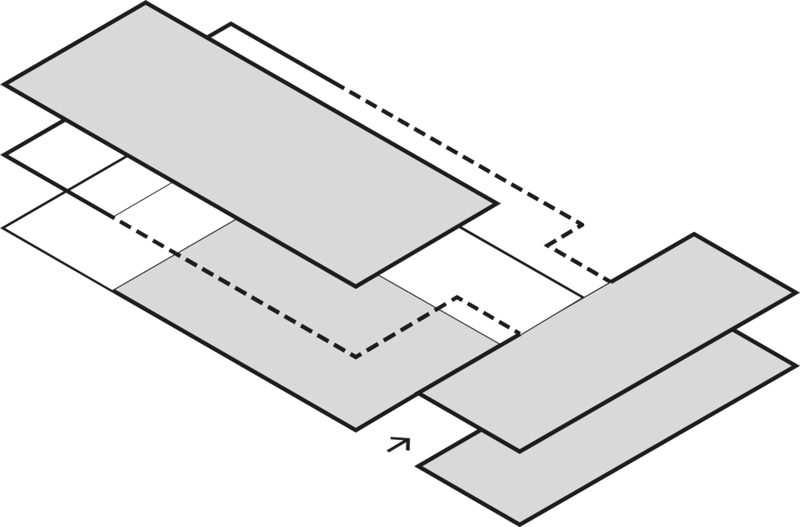 The “Fonderia Tipografica Cooperativa” (FTC) was an Italian typefoundry established in Milan in 1886. The foundry ceased activities in 2010. 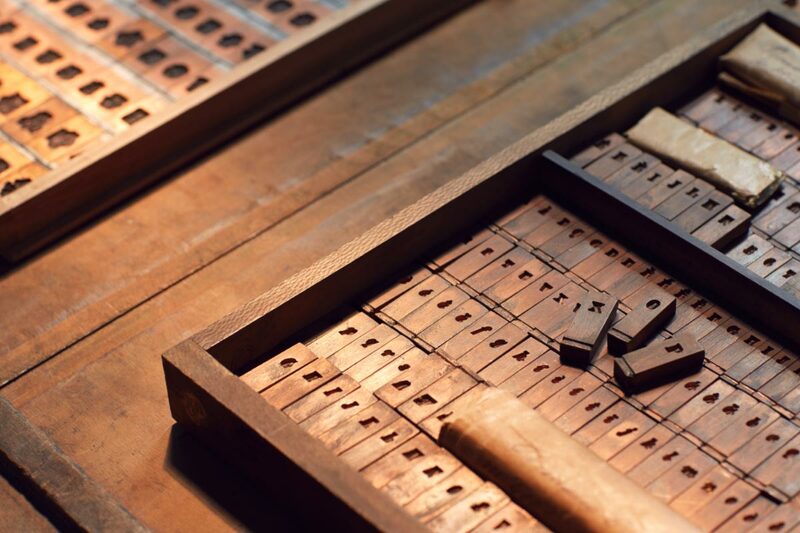 The collection holds the original brass patterns for type engraving on a pantograph and the historic matrices of the foundry. It also contains different documents from the 1970s to the 1980s. 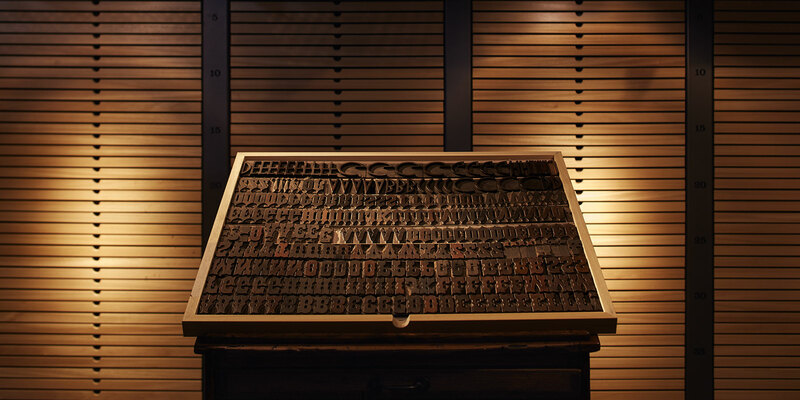 The Vincenzo Lubrano Typefoundry was one of the most important Italian typefoundries in the golden age of letterpress. It basically holds flyers and promotional printings of the Company, with photographs and sheets of correspondence. It includes: 2 folders, 1 box, 9 envelopes, 3 packages (packaged and unpackaged), 1 register, 5 files. The documented period is from 1919 to the 1980s. The printing company Manfrini was established in 1919 in Calliano (Trento). The collection houses samples of editions printed by the company and a few documents referring to the administration. The collection includes: 73 volumes (printed by the company or coming from its library), 1 register, 1 box, 9 files, 3 folders. Apart from the volumes, the material is from the 1950s to 1992. “Manifattura Etichette” (Schio, Vicenza) was a printing company specializing in labels and connected with the textile industry of the town of Schio and the surrounding area. The collection houses significant samples of commercial labels and other printed ephemera related to world of packaging. It includes: 12 boxes, 25 files and binders. The collection is from the 1940s to the 1970s. The collection houses part of the registers and administration documents of the historic printing company Zoppelli, established in 1853 by the ancestor Luigi. It includes: 6 registers, 1 envelope, 1 package. The documents are from 1880 to 1965. Part of Tipoteca’s Archive are several other collections coming from printing companies or private designers like Gugnoni-Melandri and Marone printshops, or Alessandro Gusmano and Grazia Schenone private archives. Tipoteca’s Archive is the result of 20+ years of intense researching and collecting. Through different holdings, artworks and original documents, Tipoteca describes the histories and the experiences of printers, artists and graphic designers who developed Italian visual communication in the past centuries.